No serious Bible student should ever be without a thorough, well-chosen set of cross references. 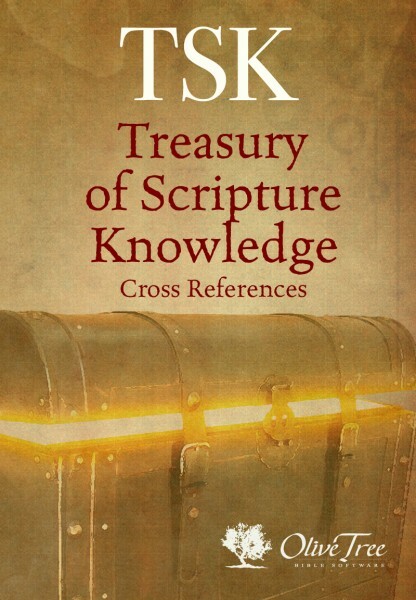 As R. A. Torrey states in his introduction to The Treasury of Scripture Knowledge, or TSK: “There is no other commentary on the Bible so helpful as the Bible itself.” Using cross references allows the Bible to speak for itself, to be its own interpreter. This is the surest and most accurate method of Bible study. Torrey’s statement echoes the apostle Peter, who said, “No prophecy of Scripture is of any private interpretation, for prophecy never came from the will of man, but holy men of God spoke as they were moved by the Holy Spirit” (2 Peter 1:20). To have a rich, detailed, and perceptively compiled set of cross references is to have a treasure indeed, for it makes the revelation contained in the Bible come alive. The Treasury of Scripture Knowledge is the best known and most widely used collection of Bible cross-references. Compiled by several authors, the work includes 500,000 Scripture references and parallel passages. It has been incorporated with most electronic Bible collections as a highly useful means of Bible interpretation.